I recently noticed fresh plywood covering the space next to upcoming Honeymee on the second floor of the Westfield Century City Shopping Center. 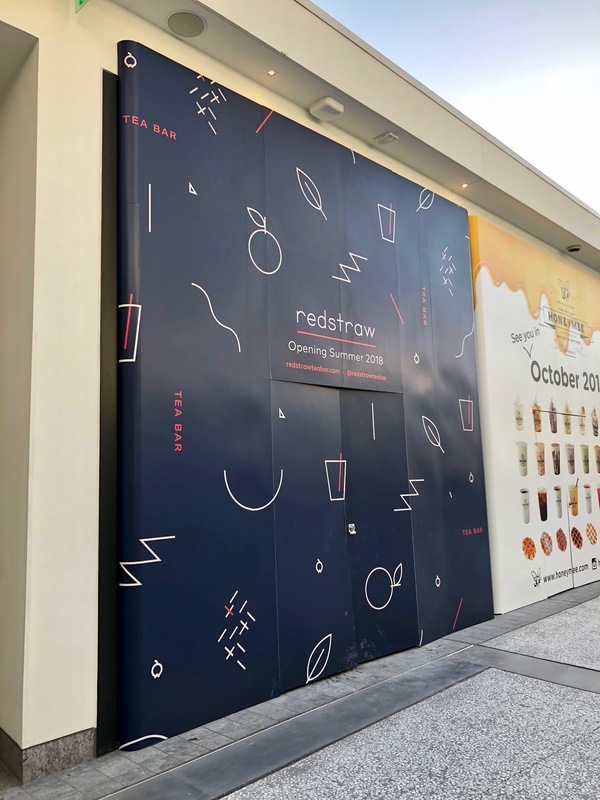 It appears that a new startup, Redstraw Tea Bar, is joining the still-developing lengthy list of new food and drink establishments. On offer? According to their website, look for “fusion style tea with a variety of toppings”. They are shooting for a summer opening. It appears that honeycomb specialist Honeymee is heading to the sparkling new Westfield Century City Shopping Center. Look for a menu of milkshakes, waffles, coffee and tea, and ice cream, including the “babee”, which is ice cream served in a sweet bun much like a hot dog. According to the signage, they’re shooting for a February opening.